Bobby Lutz, ex-head men’s basketball coach at Charlotte and a Bandys High graduate, may well be headed back into the game. A report in the Lincoln (Neb.) Journal Star says Lutz was at a college baseball game on Tuesday night at Nebraska against Creighton, where the Huskers’ new head men’s basketball coach, Fred Hoiberg, threw out the first pitch. As of late Tuesday night, Lutz had not returned a social media inquiry from HobbsDailyReport.com about the report. Lutz — whose most recent college coaching was as associate head coach at N.C. State — was on Hoiberg’s staff at Iowa State for one season and also spent one season as an assistant for the Chicago Bulls’ G-League affiliate while Hoiberg was the head coach there. Lutz turned 61 last week. 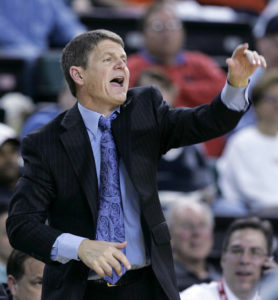 A 1976 graduate of Bandys and a starting point guard who also played shortstop in baseball for the Trojans, recently said on local (Charlotte) radio he would be open to discussions with Appalachian State about its then-vacant head-coaching job. The Mountaineers hired Dustin Kerns, previously head coach at Presbyterian. Lutz has repeatedly noted his desire to return to coaching college basketball — including an interest in again being a head coach (he also had that position at Pfeiffer University) earlier in his career – but said he would get back in the game only if he found a situation that he felt would be right for him. He and his wife, Janet (former record-setting guard at Bandys High for single-season assists), have returned to Catawba County – living in Denver, N.C. – since he left coaching.